I first heard about Stella Glow in a video game news entry about its Japanese developers, imageepoch, closing down due to bankruptcy. What followed was several news outlets reporting the disappearance of Ryoei Mikage, the CEO of imageepoch. It was weirdly reminiscent of the plot of Nanashi No Game, a Nintendo DS game that revolved around a video game development studio that closed down before the release of one of their games. A cursed version of their game got leaked out and started killing those who played it ala The Ring. Thankfully, Stella Glow avoided this fate, having been released in Japan before imageepoch went down. Its localization was handled by Sega and is set to be released in cooperation with Atlus for the Western audience, so we don’t need to wait for and play a cursed version of it. 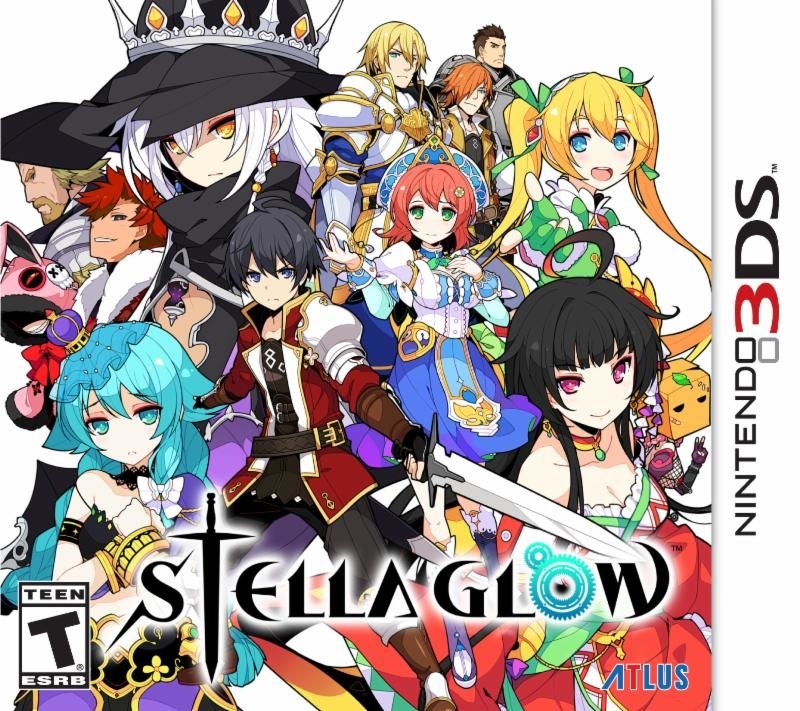 Box art for the NA version of Stella Glow. Since getting my attention with all that weird disappearing CEO stuff, I’ve been keeping an eye on any information surrounding this game. What I know about Stella Glow is that it’s a JRPG that is centered around the concept of witches and music and that’s about it. Thankfully, a demo of the game was released on the Nintendo eShop recently, so I was able to get more information about the game. 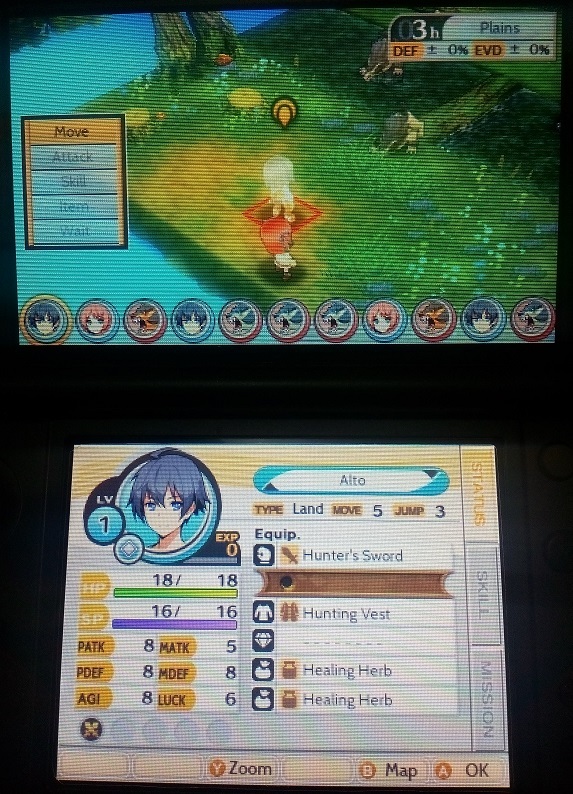 Playing the Stella Glow demo got me even more interested in the game. So what is Stella Glow all about? Well, the demo version reveals a few information about it. First, the demo will take you through the actual game’s prologue, establishing the world of Stella Glow and introducing the key characters of the storyline. As punishment for some untold crime, the deities in the Stella Glow world took away mankind’s ability to sing – a skill limited only to witches, who can use songs for magical effects. The three main characters introduced in the demo have personalities that should be familiar to avid anime and JRPG fans – we have the amnesiac protagonist in Alto, his childhood friend/lover Lisette, and the mysterious villain Hilda who gave me the impression that there’s actually some potential for her to become a heroine. I won’t go into further detail regarding the storyline to avoid spoilers, but let me say that there’s enough of a hook in the prologue that kept me playing the demo until the end. Intriguing storyline aside, the main reason why I’m even more interested in Stella Glow after trying out the demo is it’s battle system. If you ask me to describe it in five words or less, I’d say “Final Fantasy Tactics Lite” because Stella Glow employs a similar tactical RPG approach much like the aforementioned title. This battle system adds more layers to the usual turn-based RPG combat, such as terrain, elevation, and even character positioning. Also, it looks like Stella Glow will use this approach on a smaller scale so I won’t have to deal too many characters. Stella Glow’s tactical battle system is one of the reasons why I’m looking forward to this game’s release. In terms of presentation, Stella Glow looks and sounds good. Environments are detailed and colorful, and the same can be said with the character models but some may be turned off because the character models are in chibi mode. All the dialogue in the prologue comes with voice acting which is very well done, but I have to admit that my standards are lower than other people when it comes to this. Similar to other Atlus RPGs, the demo has a short anime cutscene near the end and I think we can expect the actual game to have a lot of these. 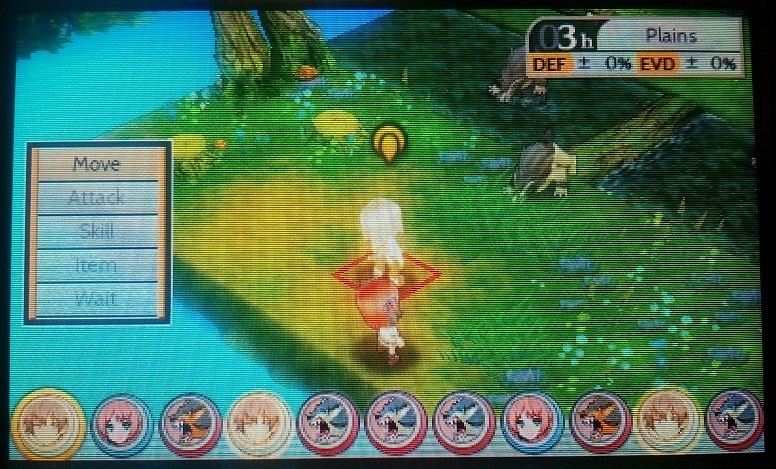 I love how RPGs utilize the second screen of the 3DS for misc. info, and Stella Glow is no exception. 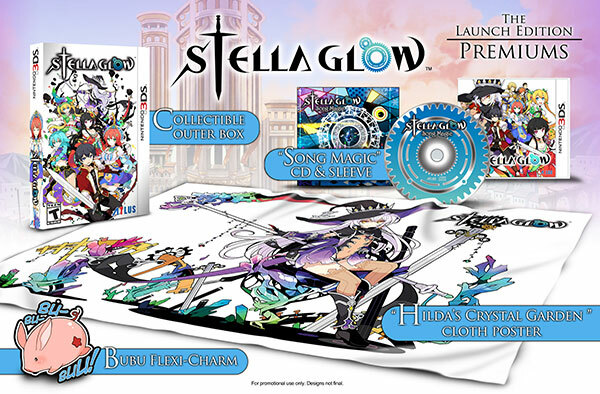 Stella Glow will come out in standard versions and in a special launch edition that comes with the game’s soundtrack on an audio CD, what looks like a keychain, and a cloth poster of Hilda. This may attract those who prefer collector’s editions, but this may actually stop me from getting the game if only the launch editions are available (which is the case for some recent releases like Etrian Odyssey 2 and The Legend of Legacy). I’m not a fan of soundtrack CDs, but that Hilda cloth poster that’s included in the Stella Glow Launch Edition looks really neat. It seems that some of the attention that Stella Glow should be getting has been stolen by higher profile 3DS releases like Yo-Kai Watch and Pokemon Mystery Dungeon, which is a shame because this looks like another quality JRPG from Atlus. Stella Glow is set to be released next week – November 17, to be exact. 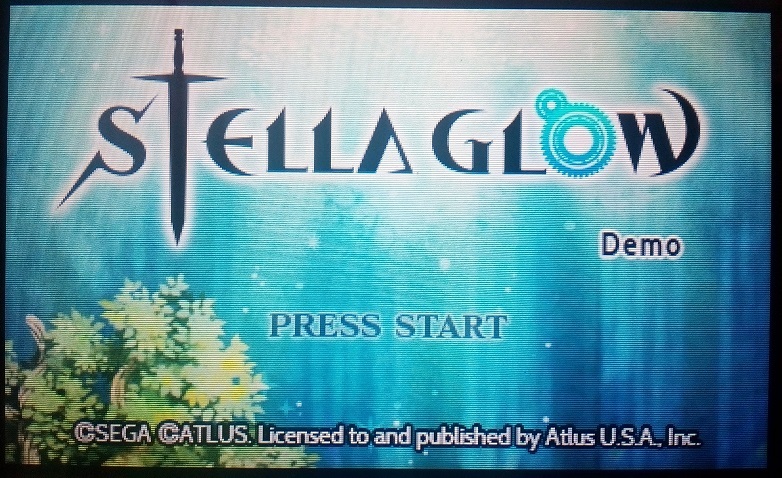 3DS owners should at least keep an eye out for reviews of this game after this comes out because it looks like Stella Glow is going to be a good addition to anyone’s 3DS game collection, especially for those who like RPGs. Are you looking forward to Stella Glow’s release? Let us know in the comments section below! Is Retrogaming Worth Your Time?